Fabulous X’Mas Gifts– by local artisanal vendors of HK . Our vendors are small and upcoming businesses of Hong Kong featuring high quality products that are guaranteed to make you want to buy them all! Lip-Smacking Food Bar – featuring multi-cultural cuisine carts brought to you by passionate food enthusiasts of HK. There is a seating area for you to savor these global flavors. From Japanese to Middle Eastern to Kebabs and delectable desserts we have it all covered for you! Dedicated Kids Corner – a guilt-free shopping experience for all the mamas out there so that they can shop till they drop! There will be an activity table filled with activities, arts and crafts throughout the day for the little ones to enjoy. Hidden Truffles aims to make this festive season a lot more merrier by giving you the opportunity to find some unique, handmade, personalized gifts for all your loved ones. We will be bringing together 33+ hand-picked & artisanal vendors for this event. Conveniently located in the Central District of Hong Kong, the venue of the bazaar (The Space, 210 Hollywood Road, Sheung Wan, Hong Kong) is an indoor air-conditioned event gallery on Hollywood Road with easy access to the public. 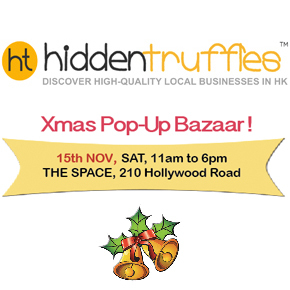 HiddenTruffles is Hong Kong’s FIRST exclusive online platform that hand-picks and showcases the FINEST high-quality SMALL & HOME businesses in HK. We feature unique, innovative and only entrepreneurial ventures. Our team scouts through hundreds of businesses, hand-picks, interviews and photographs every business, before we profile them as Hong Kong’s HiddenTruffles.The aim of our venture is to help consumers so that they can easily : Find them, contact them and rate them! This is not a directory or a general listing, but a set of hand-picked TRUSTED VENDORS for you!